« Where Are the Muslims Who Disavow Violence and Terror? Twenty years ago today — September 12, 1992 — the Space Shuttle Endeavour lifted off from the Kennedy Space Center on a joint U.S.-Japanese scientific mission that featured several space firsts. Jemison was the first Black woman in space. Mohri was the first Japanese astronaut to fly on a Space Shuttle. Lee and Davis were the first married couple to fly a space mission together. The crew conducted 44 different science experiments aboard the Spacelab-J laboratory, of which 35 were sponsored by the National Space Development Agency of Japan (NASDA). Seven were NASA experiments, and the last two were NASA-NASDA collaborations. Materials science investigations covered such fields as biotechnology, electronic materials, fluid dynamics and transport phenomena, glasses and ceramics, metals and alloys, and acceleration measurements. Life sciences included experiments on human health, cell separation and biology, developmental biology, animal and human physiology and behavior, space radiation, and biological rhythms. Test subjects included the crew, Japanese koi fish (carp), cultured animal and plant cells, chicken embryos, fruit flies, fungi and plant seeds, and frogs and frog eggs. We choose to go to the moon. We choose to go to the moon in this decade and do the other things, not because they are easy, but because they are hard, because that goal will serve to organize and measure the best of our energies and skills, because that challenge is one that we are willing to accept, one we are unwilling to postpone, and one which we intend to win, and the others, too. Well, space is there, and we’re going to climb it, and the moon and the planets are there, and new hopes for knowledge and peace are there. And, therefore, as we set sail we ask God’s blessing on the most hazardous and dangerous and greatest adventure on which man has ever embarked. Tagged launch, space history, space shuttle, speech. Bookmark the permalink. 3 Free Gifts for Signing Up! 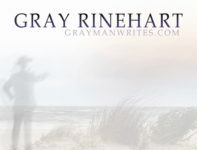 Get the latest news about Gray's stories, songs, and more by subscribing to Gray's newsletter. New subscribers receive a free e-book, a free song, and a free story! Walking on the Sea of Clouds, called "as entertaining as some of Heinlein's early fiction"
Winners, We Have (Audiobook) Winners! Congratulations to Our Latest Winners! The Gray Man Writes | Powered by Mantra & WordPress.